Following the recent UK Blu-Ray release of Irma La Douce, Eureka Entertainment have released another classic movie from Billy Wilder’s catalogue; as part of the Masters Of Cinema series. 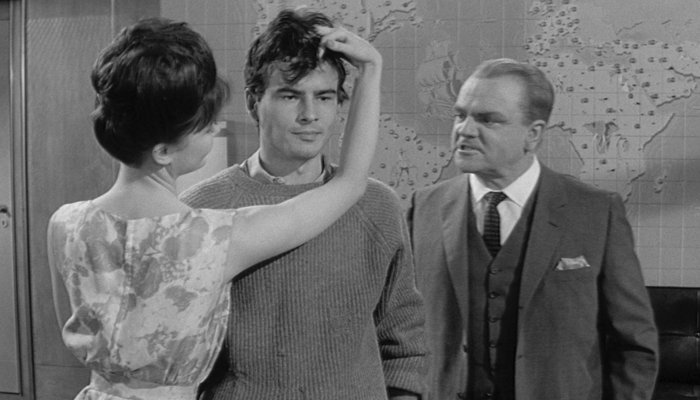 One, Two, Three is a fast paced comedy satirizing cold war and corporate politics, starring James Cagney, Horst Buchholz, Pamela Tiffin and Arlene Francis. So hectic and rapid-fire are the comedy and action, in fact, that you might miss some of the brilliantly sharp and wittily edgy gags on your first watch. Mac (Cagney) is a company executive currently consigned to running the West Berlin operation, tasked with keeping his boss’ headstrong daughter Scarlett (Tiffin) out of trouble on her visit to the city. But when she falls for a Communist from East Berlin (Buchholz), he and his two assistants have a frantic mission to try and smooth things over so that the boss doesn’t suspect a thing! Hindered by his wife Phyllis (Francis) who is yearning for a settled and easy life back home in the States, the frenetic and almost farcical repercussions for Mac keep the laughs coming thick and fast. Wilder frequently tackles controversial subjects in his films, and this is no exception. The non-biased approach to the subject has worked in the comedy’s favour. Cagney’s rather manic performance is surely one of his best, never stopping to take a breath in between lines. Much of the appreciation also has to go to the excellent supporting cast, who first appears to be a bunch of stereotypes but ultimately become very likable characters. Lilo Pulver and Hanns Lothar turn in humorous performances as Mac’s secretary and personal assistant respectively. Arlene Francis, best known to American audiences as a panelist on What’s My Line?, is the surprise of the movie; her comebacks and sassy remarks are delivered with elegance. The picture quality of this release is exceptional, along with the clarity of the excellent soundtrack by Andre Previn. The disc includes subtitles, a new and exclusive interview with film scholar Neil Sinyard, full-length commentary by film historian Michael Schlesinger, as well as a collector’s booklet featuring essays and archival material. Overall One, Two, Three left me feeling exhausted but very satisfied. The speed and intensity of the delivery – which stayed up on level 10 throughout – at times almost feels too much, but in the end just ensures that the laughs keep on hitting where they’re aimed. Despite feeling like you’ve been picked up and carried along by a force of nature, the story is also compelling in a way and I for one ended up rooting for Mac even when he least warranted support. A well-deserved and lovingly treated release, One, Two, Three is definitely one to try. One, Two, Three is available on Blu-ray from Eureka Entertainment from 15th April 2019.